It's back to school Monday in our house. Today was Ben's second day of preschool and after seeing Faith's Friday lunch, he wanted a "dog-box" too. FYI, these are 101 Damation boxes from the Disney Store. He picked a corn dog muffin (yay, those are almost gone! ), goldfish pretzels, koala cookies, canteloupe and the rest of the grapes. The box came home empty and his teachers do send home anything not eaten. Could you share your corndog muffin recipe? Yes, please do share your corn dog muffin recipe! 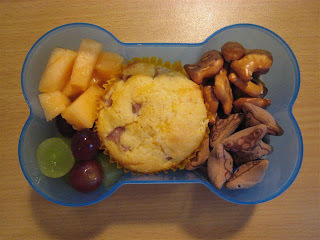 I am new to blogging and I have been on yours ALL day looking at the bento lunches and how much fun they will be for my *very* picky eater! I can't wait to find all the supplies, buy them, and try them out - she WILL be the real test of the beautiful lunches!